Today, Sunday 4th October 2009 was indeed a day of rejoicing and thanksgiving in the village of Bardwell. 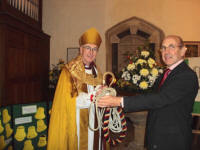 Not only was the church celebrating the harvest but also the newly restored bells were dedicated by Bishop Clive, Bishop of Dunwich. The service celebrated not only the fact that the bells had been augmented and restored but also was in recognition and thanksgiving to the team of over 40 different people who between them made the dream of 2006 come true. The Heritage lottery fund contributed £33,000 to the appeal and this together with grants of smaller but not insignificant amounts from other bodies including the Suffolk Guild, meant that work was able to start in February of 2009. The willing team of volunteers who helped Hayward Mills install the bells meant that considerable savings were made resulting in the completion of the project a lot sooner than anyone could have dreamed of. Bishop, we ask you to dedicate the new and restored bells to the glory of God and to futher the work of the church in this parish. Blessed are you, O Lord our God, King of the Universe. You have created humankind to behold your glory and to proclaim your praise. We thank you that you have given us skills of hand and eye, voice and brain that we may honour you with music, especially the music of bells. Bless us as we dedicate these new and restored bells and ourselves to our service. may those who hear them be drawn to your worship and all be renewed by your Spirit's power. Receive these new bells as a sacred trust committed to you as the rector of this church, and take care that they be ever used in God's service and for his glory. I entrust this ring of bells to the Ringers in the Blackbourne Team. Ring them in times of joy and in times of sorrow. Ring them to call the church in Bardwell together for worship. Ring them to remind the commuinity of God's love and sovereign power over human lives. Let the bells ring out to the praises of God! Following the service, there was an opportunity for visiting ringers to ring on the new bells and refreshments were served at the Tithe Barn in the village. It was a lovely service and many of the people involved in the project from start to finish were able to attend. It was especially nice to see old ringing friends supporting the occasion including Ernie Bishop, a one time Ixworth resident and ringer of both Ixworth and Bardwell bells and Albert Driver now in his 82nd year of ringing at the grand old age of 93. Bishop Clive was astonished to hear that Albert had rung for 81 harvest festivals! Now that the bells have been dedicated there are a few more odd jobs to do before ringing starts regularly, one of which is the installation of the simulator so that new recruits can learn the art of ringing without annoying the neighbours. Ruth would be particularly glad to hear from anyone who could help towards the cost of a coupler so that more than one computer can be linked to the simulator allowing teaching of several people at the same time.